The City of Toronto is looking at ways to remove sources of clear water (groundwater and stormwater) that enter sanitary sewers, which can cause sewer capacity concerns and potential overflows into the lake. 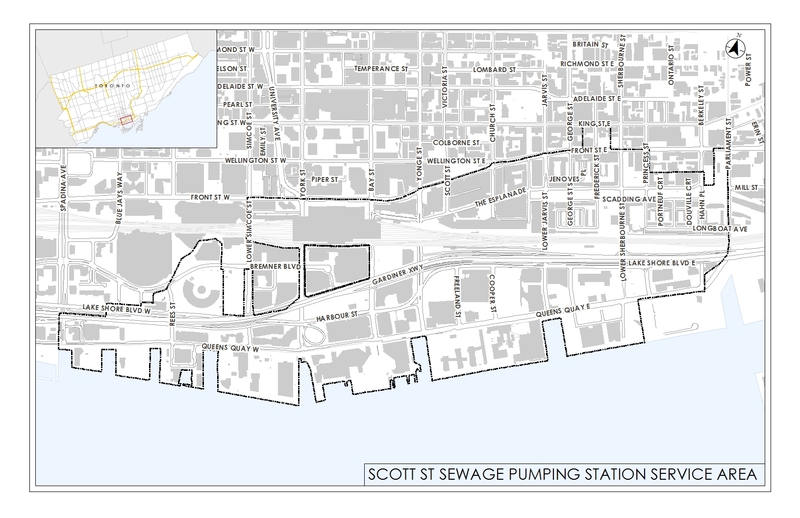 The survey area that is served by the Scott Street Pumping Station is bounded by Spadina Avenue, Front Street, Parliament Street, and the Toronto Harbour. Infiltration is clear groundwater flow that enters the sanitary sewer system through cracks in sewer pipes and leaks in maintenance holes. Inflow is clear stormwater flow entering the sanitary sewer system through inappropriate connections including sump pumps, roof drains, and surface drains. Inflow can be reduced by connecting these sources to the storm sewer system instead of the sanitary sewer system. See the diagram below for a visualization. The City and its subcontractors will be performing field investigations (drainage inspection building by building) in the project area to better understand and improve the performance of the existing sanitary sewer system. Field investigations are anticipated to begin in Summer 2018. Notice of field investigations will be provided to residents and impacted property owners/managers in the area. 1. What is an Inflow and Infiltration Reduction Project? During rain storms, rain water (clear stormwater) enters the sanitary sewer system through improper connections, pipe joints, and other defects common to an old sanitary system, overloading it and causing potential basement backups and flooding. It also increases the cost of operating and maintaining the system as clear water is unnecessarily treated. The Inflow and Infiltration reduction program identifies the root cause by finding improper connections and defects in the sanitary sewer system. Refer to the diagram. Infiltration is clear groundwater flow that enters the sanitary sewer system through cracks in sewer pipes and leaks in maintenance holes. Inflow is clear stormwater flow entering the sanitary sewer system through improper connections including sump pumps, roof drains, and surface drains. Inflow can be reduced by connecting these sources to the storm sewer system instead of the sanitary sewer system. 2. What is a sanitary sewer system? The sanitary sewer system is a network of underground pipes and pumping stations that collects and conveys wastewater from bathrooms, sinks, kitchens, and other plumbing components to a wastewater treatment plant. Sanitary sewers are not intended to convey clear water. During a rain storm, the clear water from roof drains, driveways and roads is collected by the storm sewer system that carries this clear water to a nearby creek, river or other water course. 3. 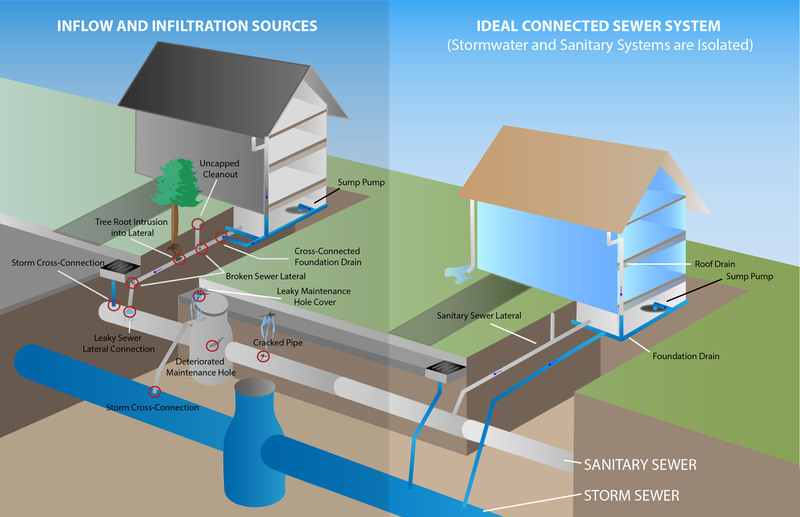 What is a storm sewer system? The storm sewer system is a network of underground pipes, catch basins and overland drainage paths that collects and conveys stormwater runoff to creeks and ponds. Stormwater runoff is water from rain or melting snow that “runs off” across the land instead of seeping into the ground. 4. Why is the City of Toronto doing these field investigations? The goal of these investigations is to identify locations where clear water enters the sanitary sewer system. The sanitary sewer system in the project area has significantly high levels of inflow and infiltration during rain storms, beyond industry-established standards. 5. What types of investigations could be completed on my property? Most field investigations will take place within City streets, though some (explained below) will take place on private property. You do not need to be present when the investigations are taking place, and field personnel will not need to enter your building or home unless scheduled with you in advance. Visual inspections (or surveys) may be completed on external drainage, such as downspouts, internal building plumbing (if scheduled), or your sewer lateral. During the sewer lateral inspection, a camera will travel from the City sewer to your foundation wall to gather information about the condition of your lateral. Fog testing involves blowing a white, harmless, odourless, non-staining smoke into the sanitary sewer in the street and observing where the smoke leaks out. Dyed water testing consists of pouring dyed water down drains or downspouts and then observing whether the water appears in the sanitary sewer system or the storm sewer system. 6. What should I do to prepare for these investigations? No preparation is required for most of the investigations. For fog testing, you can prepare by turning on any water taps for 15 minutes and pour 2-3 cups of water into all basement drains (e.g. washing machine and basement floor drains). 7. Will fog enter my home? Provided your home’s plumbing system is working properly, fog will not enter your home. If you are at home and the fog enters during testing, do not be alarmed. Simply open a window and leave the room if the fog is bothering you. Then, notify the crew in the street that smoke entered your building. 8. Is the fog or dyed water harmful to me or my pets? No. The fog and dyed water are not harmful to you or your pets’ health. Any remaining dye will wash away on its own. Fog dissipates quickly, and it will not harm clothing, draperies or furniture. 9. What will the City do with the results of the investigations? The City will use the information to understand the infiltration and inflow in this area’s sewer system. We will then develop projects to reduce the amount of clear water in the sanitary sewer system, which will reduce the overloading of the system. If an inspection reveals that your private sanitary sewer lateral requires immediate repairs, the City will share this information with you. No repairs or construction will be planned until all investigations are completed, and there is a better understanding of the problem.